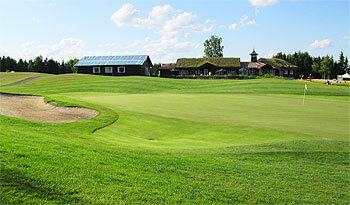 Miklagard is located to the north of Oslo and it’s one of Norway’s best courses. It opened for play in 2002 with every intention to rate alongside the world’s top courses. And it’s doing well, recognised as one of the top courses in the country. Designed by Robert Trent Jones Jnr. as a tournament course, Miklagard has quickly gained the support of many top European golfers who have played the course in the annual Canon Pro Series and most regard the greens as amongst the best and fastest in Europe – most of which are elevated and well protected by deep bunkers. Miklagard is also one of the flagship courses in the PGA European Tour stable, so it will come as no surprise that it’s long. In fact, it measures a brutal 6,765 metres from the tips, so make sure you chose your tee carefully. Couple the enormous length of Miklagard with lots of changes in elevation and you have a real challenge on your hands. Situated a very convenient 10-minute drive from Oslo airport, the stadium course at Miklagard is home to around 950 members, who enjoy a relatively short six-month season that lasts from approximately 1st May to 20th October. To satisfy the golfing demands of its members, the club has now implemented reciprocal agreements with a number of top Spanish and Portuguese clubs to allow its more committed golfers to play through the winter in warmer climes. I was lucky enough to play in the Norwegian Challenge pro-am event today at Miklagard, taking place in advance of the latest competition on the European Challenge Tour which starts tomorrow. The Norwegians certainly constructed a monster of a layout when they commissioned this modern golf course - purpose built for national and international golf tournament play - and I can see a lot of traditionalists not taking a shine to a bold and brash young pup that bears little resemblance to any of the highly regarded old Norwegian tracks which have evolved down the years in this part of Scandinavia. It may also not endear itself to many ordinary, medium to high handicap players as it’s very tough and uncompromising - with a slope rating of 144 from the back markers - which is just what elite golfers require if their superior golfing skills are to be challenged, of course. It’s evident that a substantial cubic yardage of dirt was moved when sculpting the fairways and greens here and there’s also a fair amount of sand and water to add further difficulty to the task in hand. Greens (which have an innovative sub-air system installed) were running at a mere 10.7 on the stimpmeter in preparation for the professional tournament when I played and I doff my golfing cap at the top pros who appear to take such slick green speeds in their stride, especially on the undulating, multi-tiered putting surfaces here. I can’t recommend a visit to play Miklagard for those seeking a typical Norwegian golfing experience - look elsewhere, as there are plenty of those to be found all over the country - but for golfers who want to play an engaging new millennium modern golf track that will test their game to the fullest, it has my wholehearted endorsement. Just take extra care in choosing the most appropriate tees that will allow you to best tackle this impressive Nordic giant. I have played Miklagard several times, but I dont understand why it is ranked #1. The greens are quite good, I find it irritating some of the holes does not reward decent good shots. This course is constantly rated as Norway's best of all the big guides - and theres a reason for it. By a margin the best course in Norway. Great design, difficult but fair, very good conditions and great off course facilities. It may not have a scenery too match the qualties of the course, but if you play golf - this is where you should go in the Oslo area. Variety and a great mix of holes and challenges. Hit it where you want? Have you played the course? Thick Bermuda grass and thin fairways. You can hit a perfect drive. But the fairways are fast and ig you are in the rough you are lucky if you can find the ball. Best in Norway! But I havent played all in Trondheim, Bergen and in the north. Naturevise it isnt the best. The best naturevise is Tyrifjorden. I have played golf for over 30 years (hcp 3) and have clear thoughts how what is a good course and what is not. Now, Miklagaard is not a bad golfcourse. It is pretty long and not easy to score on. Although still young the conditions are usually very good although prime season in Norway is only from july to september. But having played Falsterbo, Barsebäck, Halmstad, Ljunghusen and some more great courses in Sweden, I can´t understand how Miklagaard can rank this high? To me, it is just not good enough. THe layout is pretty uninteresting, the landscape pretty boring and the logic behind some of the holes makes me wonder if Mr Jones is over the hill. Many of the greens are too undulated and not fair to put on. But on a Norwegian scale, yes the course is good and set for competitions. but on an european scale Miklagaard shouldn´t be in the best 100. The course should be played from the back tee. Its what it is designed for. The greens was awsome for three and four years ago. They had som bad years, but they are fantastic again now.